It’s the talented and uniquely empathetic writer who can successfully tell a story from a non-human perspective. Yoko Tawada is one of those writers, along with Yuya Sato (Dendera) and Yusaku Kitano (Mr. Turtle). 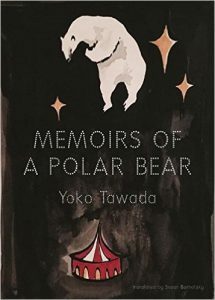 In Memoirs of a Polar Bear, Tawada doesn’t just inhabit the mind of a polar bear to explore such issues as Cold War politics, ancestry, inheritance, entertainment, and consciousness; no, she gives us the thoughts and aspirations of three different polar bears: the grandmother matriarch, her daughter Tosca, and Tosca’s son Knut. And then there is Tosca’s human friend/teacher Barbara’s perspective, as well, through which we learn about the world of the circus in a divided Germany. Each bear has a different relationship to the human community, even as they all perform, at different points in their lives, for human entertainment. While the grandmother polar bear writes a bestselling autobiography and mingles freely with humans, Tosca has somewhat less freedom as a circus performer, and Knut never knows the world outside of the zoo in which he is raised. Nonetheless, each bear has a close and mutually-beneficial relationship with one or more humans, and it’s in these exchanges that Memoirs is at its post poignant. Tosca and Barbara, in particular, are able to communicate through a shared dream and eye-contact- a relationship completely opposite from that of the polar bear and her audiences. Memoirs, while an exquisite speculative study of the relationship between humans and polar bears and of polar bear consciousness, is ultimately a story about human relationships, exile, and cultural ignorance/discrimination. At various points, each polar bear cringes when some human says that the bear is from the North Pole- in fact, the bears are born in the Soviet Union, Canada, and East Germany, respectively. And yet, just because they are polar bears, human audiences and journalists assume that they’re from the ancestral homeland. This lack of careful inquiry and the prevalence of dismissive assumptions leads the polar bears to feel like outcasts in their own countries, misunderstood and viewed as curiosities rather than creatures with thoughts and emotions. I think it’s fair to say that humans do this to each other with alarming regularity. Tawada’s use of polar bear narrators invites us to see that kind of lazy thinking from a different perspective, perhaps opening some readers’ eyes to the multiplicity of human experiences and the insult that comes with dismissive judgments. One of the most interesting books I’ve read this year, Memoirs of a Polar Bear will entrance you, too.